The original post can be found on Nancy Ross’s site Experiments in Art History. Digital art history is a sub-field within digital humanities (#dh). I’ve read and listened to presentations about big, well-funded digital art history projects at conferences, but I’ve been interested in teaching some of the basics of digital art history in my upper-division classes using free tools. In a previous class, I did a social networking data visualization project with my students, but I had to get some help from a visual technologies student to actually create the visualization. I am interested in using simpler tools that I can use on my own. I recently completed a small digital art history project in my Twentieth Century Art class and would like to share what we did and the (relatively simple) steps we took to get there. I was chatting to another art history professor about beginning my Twentieth Century Art class this semester and she suggested doing something with the Armory Show of 1913. 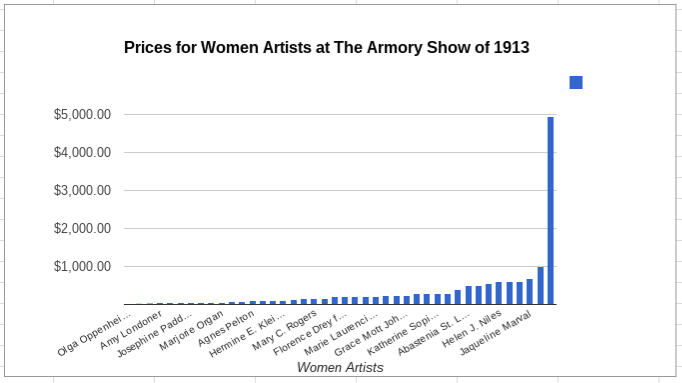 I liked that idea and went about looking for resources online, particularly resources that discussed the gender and the Armory Show. I found almost nothing on gender except for two blog posts (on women as artists and women as patrons), but I did find this list of artists, titles, media, and sale prices from the exhibition catalog. I started looking through the list and realized that there was enough primary source material to do something interesting. I realize that the following instructions are simple, but I also think that art historians are not generally accustomed to looking at art history information in this way. Digital art history allows us to ask and answer different kinds of questions and I believe that those questions are worth addressing. In my classes, I want students to ask and answer lots of different kinds of art history questions, and I want to demonstrate that there are a variety of ways to find answers. 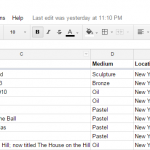 I divided up the artists and assigned students to enter different chunks of the list into a spreadsheet in Google Docs. We added a column for gender. 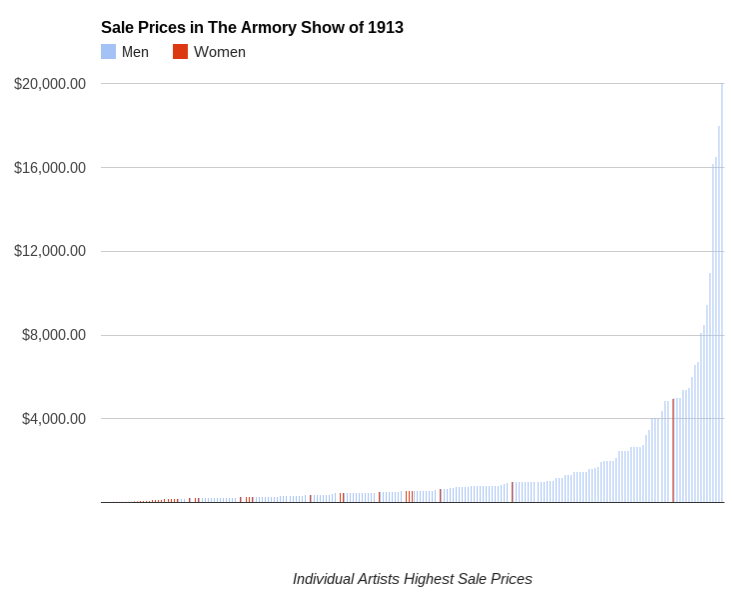 There are 1187 lines of data in the spreadsheet, with each line representing one work of art that appeared in the catalog for the Armory Show. As a class, we brainstormed a bunch of questions, some of which I’ve reproduced below. I’ve also added a few. 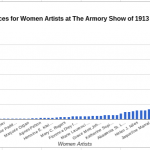 How many women artists participated in the Armory Show? How does the number of women compare with the number of men? What percentage of works of art were requested vs submitted by the artist? How do the request vs submitted works of art break down by gender? Who sold their art for the most/least money? 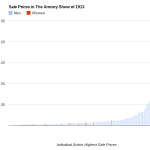 What was the role of gender in sale prices? What were the dominant media in the show? One of the easiest ways to manipulate the data is to sort the entries, meaning that you will re-arrange the lines of data by putting the entries into alpha-numeric order or reverse alpha-numeric order. I can find out which work of art sold for the most money if I sort the “Sale Price” column in reverse alpha-numeric order. To do this, I click on the column letter (“F”) above “Sale Price,” to select the column. 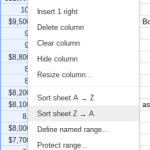 I then right click on the column letter, and then select “Sort Sheet Z-A” from the menu that appears. Once sorted, I can see that the highest priced work of art was Paul Cezanne’s The Old Woman and the Rosary, which sold for $48,600. This will only work if you make sure that there are only numbers in the “Sale Price” column. Any other notes need to be in a different column, or the prices will not sort in a meaningful way. Now that I’ve collected, questioned, and organized data, I’m ready to visualize the data by making a graph. I’m interested in the sale prices for works of art by women. I sort the “Gender” column alphabetically and then highlight and copy all of the data on women. I want to keep this separate information separate, and so I click on the plus sign in the lower left corner, which adds another table to my spreadsheet. I can use the tabs at the bottom of the window to toggle between the tables. 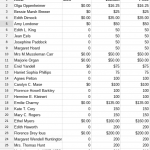 In this new table, I paste the data on women and then delete the extra columns so that only Artist and Sale Price remain. I delete multiple works by the same artist leaving only their highest priced work of art. I sort the prices from lowest to highest and then highlight both columns and click on the “Insert Chart” button in the toolbar. You can play around with the chart tools to get the chart you want and then customize it. If you need further instructions, YouTube is full of short video tutorials that will show you what to do if you need more help, like this one. The resulting graph shows women’s prices from low to high. 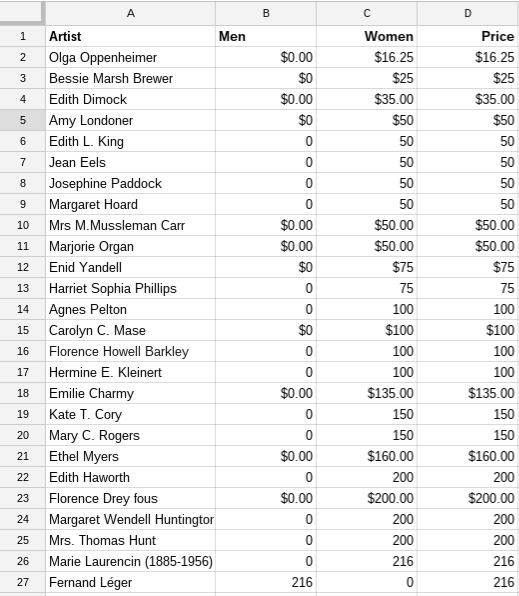 There isn’t enough room to put all 50 women’s names on the bottom, but it is easy to see that the women’s prices are relatively low, with one exceptional outlier (Mary Cassatt). Now I want to understand how women’s prices compare to men’s prices. I want to create another graph that shows both so that I can see the differences at a glance. I create a new table by clicking on the plus sign and then copy and paste the data from the original sheet. I delete the extra columns, leaving Artist, Gender, and Price. I delete multiple works by the same artist leaving only their highest priced work of art. I add a new column and rename Gender so that I now have a column titled Men and another titled Women. For women’s pieces, I place the sale price in the women’s column and a zero in the men’s column. For men, I place the sale price in the men’s column and a zero in the women’s column. I’ve just created a second series that will allow the men’s and women’s prices to be represented in different colors. Cezanne, with his outlier high price, makes it difficult to see the lower prices, so I changed the max value to $20,000. You can now see Mary Cassatt’s high price in relation men’s high prices. Although the artists’ names are missing, you can easily see that the women’s prices were at the low end, while men’s work commanded the highest prices. Part of digital art history is converting elements of art history into numbers. These can be prices, as I demonstrated here, but the numbers can also come from counting similar kinds of objects, people, words, dates, or things. In my class, I assigned the data entry for homework, which took students a week to complete. Then we spent a little time in each class during the following week to talk about observations and then turn those observations into questions. The next week, I got students to attempt graphs and in the following week we worked on improving those graphs. Once we had more polished graphs and were more comfortable with sorting, we those tools to better understand the art market in 1913. Impressionist and Post-Impressionist paintings commanded the highest prices. Their work had been growing in favor in America. There were also many younger artists who were involved with the Armory Show who would later become famous. Pablo Picasso and Constantin Brancusi’s both sold works for $1350. Fernand Leger, an artist whose work is a staple of many European collections today, only managed a high price of $216. Examining the art market in American in 1913 tells us about how American critics and collectors viewed and valued European and American art at that time and provides insights on the role of gender in that market, both valuable learning outcomes for my students. Nancy Ross is an Assistant Professor at Dixie State University. She previously contributed a post on THATCamp.